BEIJING -- China plans to increase its defense budget by 14.9 percent in 2009, a parliament spokesman said in Beijing on Wednesday. The planned defense budget is 480.686 billion yuan ($70 billion), a rise of 62.482 billion yuan from last year, Li Zhaoxing, spokesman for the second session of the 11th National People's Congress (NPC), told a press conference. Defense spending accounts for 6.3 percent of the country's total fiscal expenditure in 2009, slightly down from the level of previous years, Li said. The budget rise follows a 17.6 percent increase in 2008 compared with the previous year. The capacity of the armed forces for disaster relief and anti-terror operations shall also be enhanced. Spending on the reconstruction of military facilities damaged in the 8.0-magnitude earthquake that stroke southwest China's Sichuan province on May 12 last year was also listed in this year's defense budget, he said. Li described the defense budget growth as "modest", saying that China's defense expenditure was fairly low compared with other countries, considering the size of China's population and territory. "China's defense expenditure accounted for 1.4 percent of it's GDP in 2008. The ratio was 4 percent for the United States, and more than 2 percent for the United Kingdom, France and other countries. This year's draft national budget would be deliberated at the NPC annual session due to open in Beijing on Wednesday. 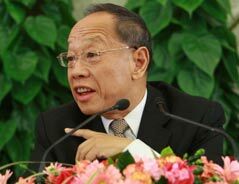 "So the country has no so-called 'hidden military expenditure', " Li said. In a white paper on China's national defense in 2008, issued in January this year, China said its defense expenditure had always been kept at a reasonable and appropriate level. In the past three decades of reform and opening up, China has insisted that defense development should be both subordinated to and in the service of the country's overall economic development, according to the white paper. "Although the share of China's defense expenditure in its GDP increased, that in the state financial expenditure continued to drop on the whole," says the paper. In the past two years, the increased part of China's defense expenditure was primarily used to increase the salaries and benefits of servicemen, compensate for price rises and push forward the revolution in military affairs, according to the paper.